It’s not Diamond Rock. That distinguished-looking islet off the south Caribbean coast of Martinique is much larger. It also has a lot more history. Ilet La Perle, though, comes close to matching its more famous southern cousin in one area: scuba diving. La Perle sits less than two miles off Anse Couleuvre at the far north Caribbean edge of Martinique. The area is about as off-the-beaten-path as you can get here. Driving north along the Caribbean coast, major highways give way to local roads trailing through quiet fishing villages. Eventually, just past Le Prêcheur, the road narrows, the asphalt turning to concrete. Ever-thickening rainforest crowds in all around. Temperatures drop as the air gets crisper. There’s a raw, more pristinely natural sense to the area; one that makes you forget that the bustle of Fort-de-France is just an hour or so away. Standing on Anse Couleuvre, Ilet La Perle is impossible to miss. The majestic rock is nice enough to admire from the shore, but it’s the undersea attractions that are the real draw here. Prime scuba depths around La Perle range from 65- to 200-feet. Parrotfish, snapper, bigeye trevallies, grouper, rifleman, and barracuda are among the 68 different fish species commonly found among the rich corals here. Green turtles and dolphin also abound. Best of all, you won’t likely find crowds of other divers in the clear waters off La Perle, owing to the islet’s remote location. 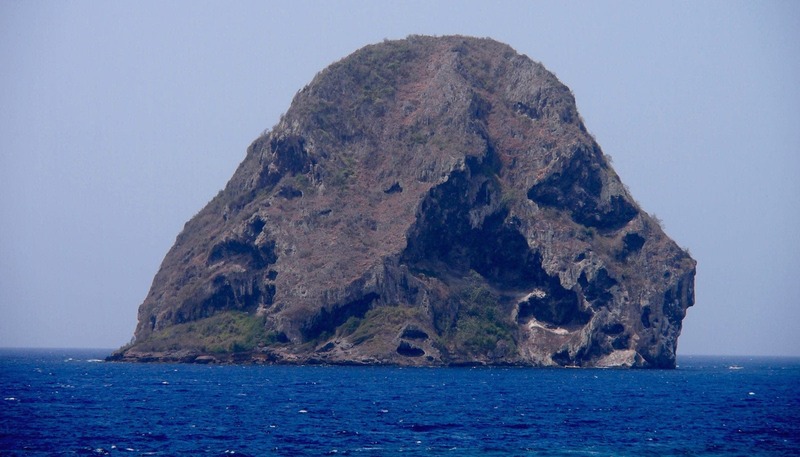 Now, divers should never miss Diamond Rock when visiting Martinique, of course. Le Perle, though, harbors some pretty nice treasure for you to explore as well. Last updated by Steve Bennett on 03/25/2019 . Hovering above the sea at the Hotel Bakoua in Trois-Ilets, the Coco Bar does more than enough to entice you by just sitting there. Sometimes, it seems, the more familiar you are with something, the less attune you become to its subtle details.